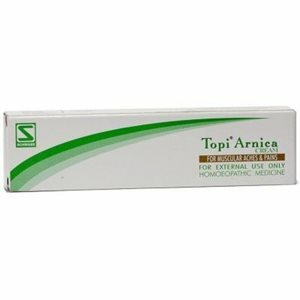 Homeopathic Schwabe Topi Arnica Cream is ideal for muscular aches and pains due to injuries and wounds, improves the local blood supply, accelerates healing, increases the rate of re-absorption of internal bleeding, effective compress for bruises, sprains and muscular pain. 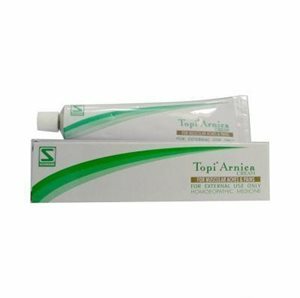 Schwabe Topi Arnica Cream contains Arnica montana 10% w/w, cream base q.s. It contains alcohol from the ingredients. The cream should be used 2 to 3 times daily by applying a thin layer to the cleaned and dried affected areas. The cream should be lightly massaged into the skin. For the use of Topi Arnica under a bandage or tape, avoidance of airtight materials and daily changes are recommended. Do not use this product in patients known to be hypersensitive to plants of the Arnica family (Compositae). No interactions between Topi Arnica and other products are known.